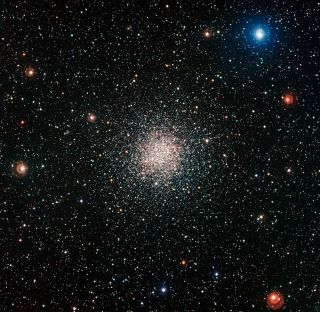 The globular star cluster NGC 6362 was photographed by the European Southern Observatory, reavealing tens of thousands of stars, some of which appear deceptively young. An ancient but little-known star cluster is giving astronomers a celestial Halloween treat in a dazzling new photo from the European Southern Observatory. The cluster NGC 6362, what's known as a globular cluster, was observed by the Wide Field Imager attached to the MPG/ESO 2.2-metre telescope at ESO's La Silla Observatory in Chile. The resulting stunning photo reveals tens of thousands of very ancient stars, along with a number of stars passing off as younger than they are. Globular clusters are tight balls of stars that orbit the outskirts of galaxies. Most of the stars inside them are thought to have formed at roughly the same time, so they are of a similar age,typically about 10 billion years old. Indeed, most of the stars inside NGC 6362 are red giants that appear yellow and aged. However, the observatory's view also shows a number of so-called blue stragglers, stars that appear younger than their true age. These stars are bluer, more luminous, and more massive than they should be after 10 billion years of stellar evolution; if they had truly formed that long ago, they should have already died. Astronomers suspect that blue straggler stars weren't born as massive as they are now. Instead, there are two possibilities: these stars have either stolen mass from companion stars, or are the result of mergers between two stars that collided. The cluster NGC 6362 lies in the southern constellation of Ara, the Altar, and it can be spotted through a small telescope. It was first discovered in 1826 by the Scottish astronomer James Dunlop using a 22-centimeter telescope in Australia.